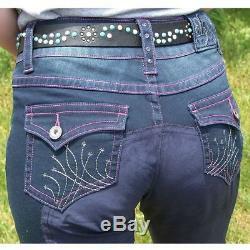 2KGrey Riding Jean Patriot Full Seat Riding Breeches Denim Fabric 27. 2KGrey Riding Jean Patriot Full Seat Breech Ride in style with 2kGrey Riding Jean Full Seat Breech. Stretchy indigo denim fabric gives your the perfect, slimming fit along with real comfort. Including rhinestone detailing, amazing embroidery and high contrast stitching and button details that make this breech fun and modern. Features: Stretchy indigo denim fabric High-Contrast stitching Embroidery featuring fireworks design Rhinestone detail Full length tapered leg Machine washable Micro-suede seat and knee patch for non-slip performance Item Specifications: Color: Indigo Blue Material: 68% cotton, 29% polyester, 3%dex. Be the first to receive exclusive offers and promotions. Listing and template services provided by inkFrog. The item "2KGrey Riding Jean Patriot Full Seat Riding Breeches Denim Fabric 27" is in sale since Tuesday, April 4, 2017. This item is in the category "Sporting Goods\Outdoor Sports\Equestrian\Clothing & Accessories\Women's Clothing\Jodhpurs & Breeches". The seller is "onestopequineshop" and is located in Beloit, Wisconsin. This item can be shipped to United States, Canada, United Kingdom, China, Mexico, Germany, Japan, Brazil, France, Australia, Denmark, Romania, Slovakia, Bulgaria, Czech republic, Finland, Hungary, Latvia, Lithuania, Malta, Estonia, Greece, Portugal, Cyprus, Slovenia, Sweden, South Korea, Indonesia, Taiwan, South africa, Thailand, Belgium, Hong Kong, Ireland, Netherlands, Poland, Spain, Italy, Austria, Bahamas, Israel, New Zealand, Philippines, Singapore, Switzerland, Norway, Saudi arabia, Ukraine, United arab emirates, Qatar, Kuwait, Bahrain, Croatia, Malaysia, Chile, Colombia, Costa rica, Dominican republic, Panama, Trinidad and tobago, Guatemala, El salvador, Honduras, Jamaica, Antigua and barbuda, Aruba, Belize, Dominica, Grenada, Saint kitts and nevis, Saint lucia, Montserrat, Turks and caicos islands, Barbados, Bangladesh, Bermuda, Brunei darussalam, Bolivia, Ecuador, Egypt, French guiana, Guernsey, Gibraltar, Guadeloupe, Iceland, Jersey, Jordan, Cambodia, Cayman islands, Liechtenstein, Sri lanka, Luxembourg, Monaco, Macao, Martinique, Maldives, Nicaragua, Oman, Peru, Pakistan, Paraguay, Reunion, Viet nam.